The next upside push in the bitcoin market could prompt the cryptocurrency a form new bottom below $3,100. Josh Rager, a hugely followed cryptocurrency market analyst, pitted the current bitcoin price action against another one from the year 2015. He found striking similarities between them, mainly related to a higher high and a higher low formation and their relationship with declining volume. In the 2015 chart, BTC could be seen pursuing a long-downtrend action towards $200-250 range. Following a so-called bottom formation, the price is undergoing a sizeable bullish correction towards $400-425 range. Then, bitcoin forms a bullish flag, leading to the establishment of a higher low point near $300, followed by a double top and a higher high formation above $440. Eventually, it turns into a false breakout when BTC starts correcting from the higher high, eventually forming a new bottom towards $175. 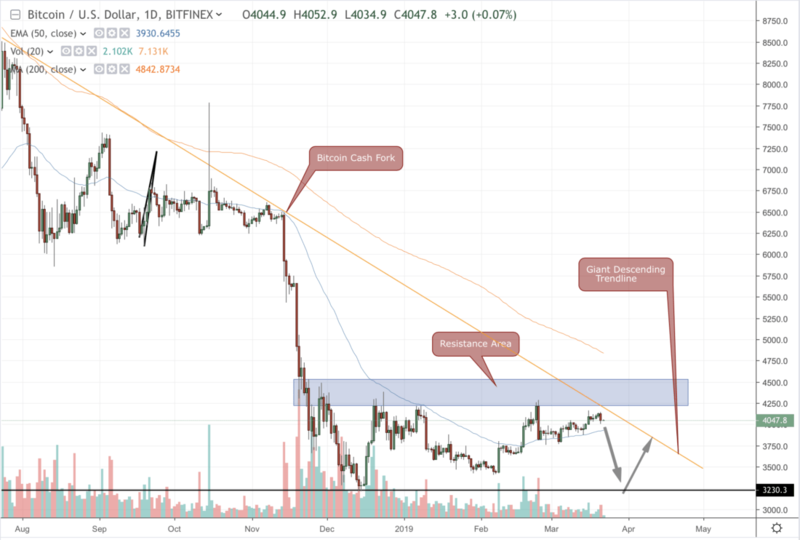 In the current market scenario, bitcoin is halfway through while repeating the price action from 2015. The price has formed a higher low and is now moving upwards to establish a possible higher high. In the event of a false breakout, BTC could eventually break below its short bottom near $3,100. Josh Rager’s prediction came in the wake of bitcoin’s inability to extend its recent upside momentums. Analyst PlanB earlier noted that the cryptocurrency was behaving similarly to how the shares of technology giant Amazon acted following the dotcom crash. Between 2000 and 2001, AMZN underwent a 95-percent drop, from $105 to $5. Similarly, bitcoin – a cryptocurrency giant of its own – slipped almost 75-percent during the 2018’s crypto market crash. Technical analyst going by the pseudonym of Financial Survivalism noted that BTC was trending under a giant descending trendline. It showcased the likelihood of bitcoin price going as low as $800 if it continues to trade horizontally under the $4,600-resistance mark. In contrast, other analysts said that while bitcoin could break below its current bottom at $3,100, the likelihood of it going below $1,000 was less. Leah Wald, a former economist at the World Bank, noted that BTC would initially fall below $1,500 but would later change direction with an upside target in view at $6,500. Bloomberg analysts also forecasted that bitcoin would crash further towards $1,500 before it corrects any higher. While not many traders are entering long positions on bitcoin’s higher-high formations near $4,000, the asset’s fundamentals continue to inject decent bullish sentiments to the market. A double-bottom reversal scenario, coupled with bitcoin derivatives launch, could allow the asset to undergo a bullish reversal action. That said, a bounce from the next bottom would open long positions towards the resistance-like giant descending trendline. A break above it would prompt bitcoin to meet the resistance area the market faces today. In the best case scenario, bitcoin could end up forming another higher high, against what Josh Rager predicted. If it does, then the resistance-target would shift towards the 200-period moving average. The post How Bitcoin Higher High Formation Could Push It to $2,000 appeared first on NewsBTC.